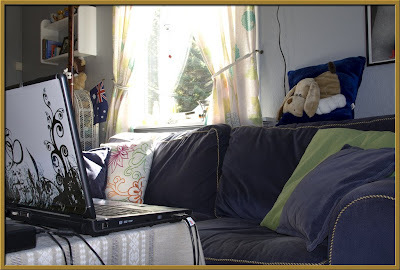 Scene of the Blog Featuring Hilde of The Turn of the Page! 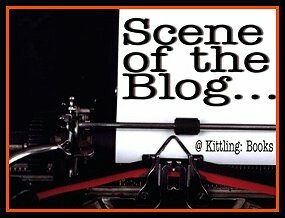 I think I first came across this week's featured book blogger by reading one of the comments she left on another blog. Hilde is a self-styled "translator, book lover, chocolate addict and dreamer," and you can find her eclectic mix of books and memes at The Turn of the Page. Hilde has begun a new feature that I hope to see a lot more of. In "Norwegian Edition", she lets us take a look at the Norwegian edition of a well-known book because-- and this is so very true-- "usually we only see the US and UK editions of books across the blogosphere." I certainly hope you take the time to visit Hilde at The Turn of the Page. Don't forget to say hello while you're there! Oh... and before we get to the good stuff, don't forget that you can see all the photos in larger sizes just by clicking on them. Time to show us your space, Hilde! I live in a tiny two-room flat so my blogging space is very limited. Although I do have a corner desk I don’t like sitting there for any longer period of time, so my laptop lives on the coffee table. Here I have everything I need within easy reach: the bookshelf, pen and notebook (yes, I’m one of those old-fashioned people that still like to write notes and ideas on actual paper rather than electronically), a cup of tea and the remote controls for the TV and stereo. I usually watch TV with half an eye while I’m blogging or surfing the net. Occasionally I’ll write a post or two at work as well – the perks of being your own boss! The couch is my favourite (and only, if you don’t count my bed or the floor) reading place. I bought it when I was about 14 after saving all my pocket money and gifts for almost a year, and let me tell you, it’s the best purchase I have ever made. It is so soft and comfy and perfect for snuggling up with a blanket and a good book. 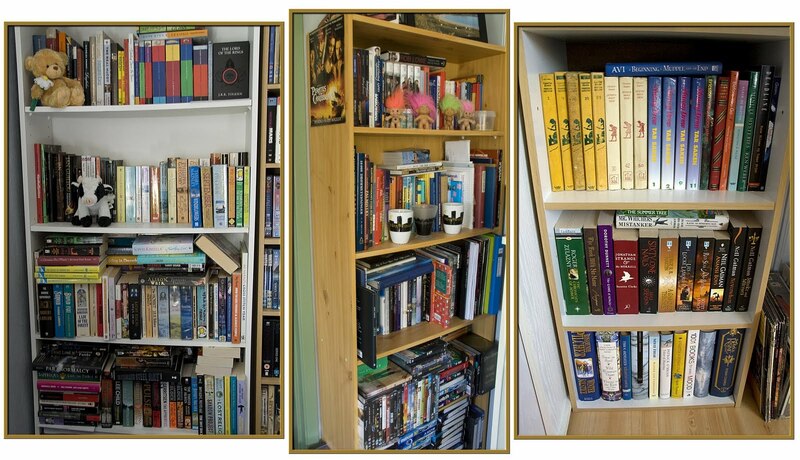 [Above left] This is my main bookshelf where I keep most of the books I haven’t read yet (and some that I have). As you can see it’s starting to get out of control. 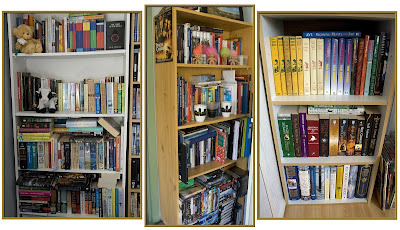 The bottom two shelves are double-stacked, and it seems to be spreading upwards… [Above middle, above right] I also have another full-sized case where I keep things like my Christmas books, non-fiction books and sheet music (and part of my DVD collection), and a small case with some fantasy books, hardcovers and Nancy Drews. I find it hard to throw things away, so I have a lot of knick-knacks in between. Although I still read and buy lots of paper books, I have to say I love e-books more and more. This is Pickwick, my trusty Kindle. He’s both a blessing and a curse; a blessing in the sense that I can buy hundreds of new books without worrying about shelf space, and a curse in the sense that I can buy hundreds of new books without worrying about shelf space. I recently changed the screensaver pictures from the usual dead authors to my favourite celebrities, but I’m beginning to think that wasn’t such a good idea after all – now all I do is sit and stare at the screensavers instead of reading! And finally, this is what I saw when I looked out the window one night not long ago! Thank you Cathy, for having me on Scene of the Blog! It’s been a pleasure! Wow-- what a sunset! 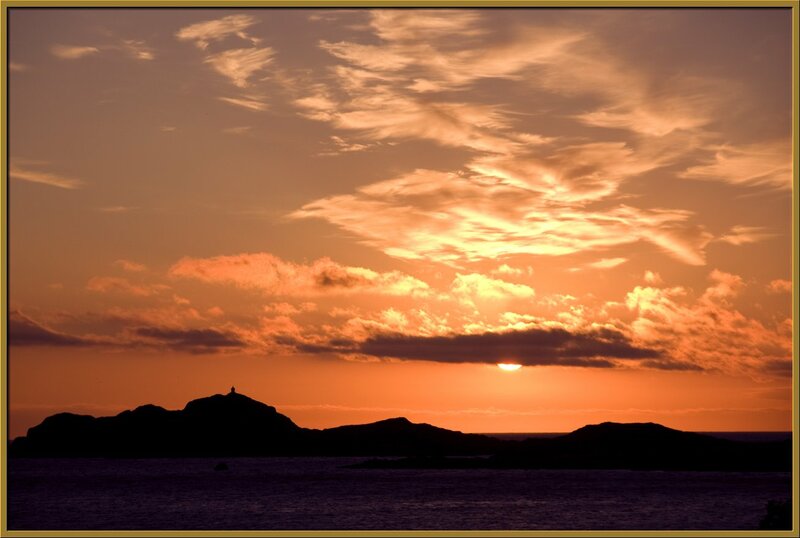 Looking at it in its larger size, it looks as though there's someone standing at the top of one of the hills watching the sunset, too! Your flat may be tiny, but there are many things I like about it: the sunlight streaming through the window onto that comfy couch, all those books on the shelves, the Pirates of the Caribbean poster hanging on the side of one of the bookcases, that blue candle on the coffee table... just to name a few! Thank you so much for sharing your creative space with us, Hilde. We really appreciate it! Though her space is small, it looks very cozy and comfortable. 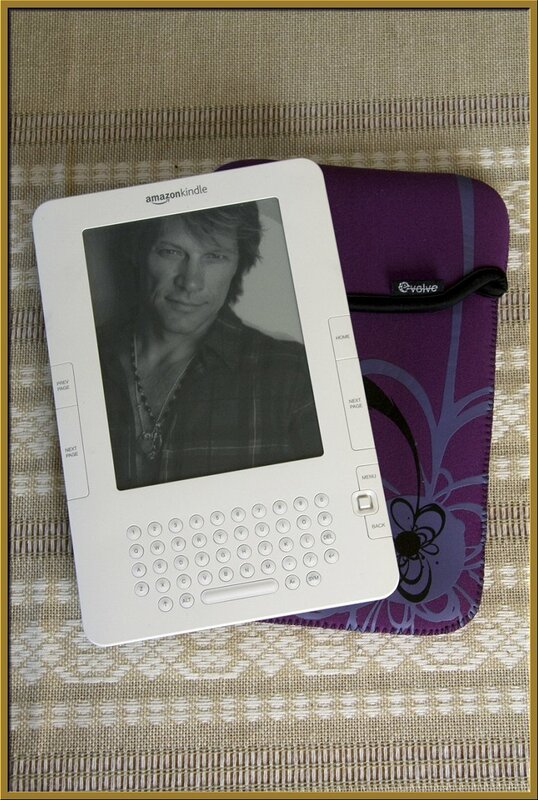 I also like the celebrity screen savers and think I am going to have to go search those out! 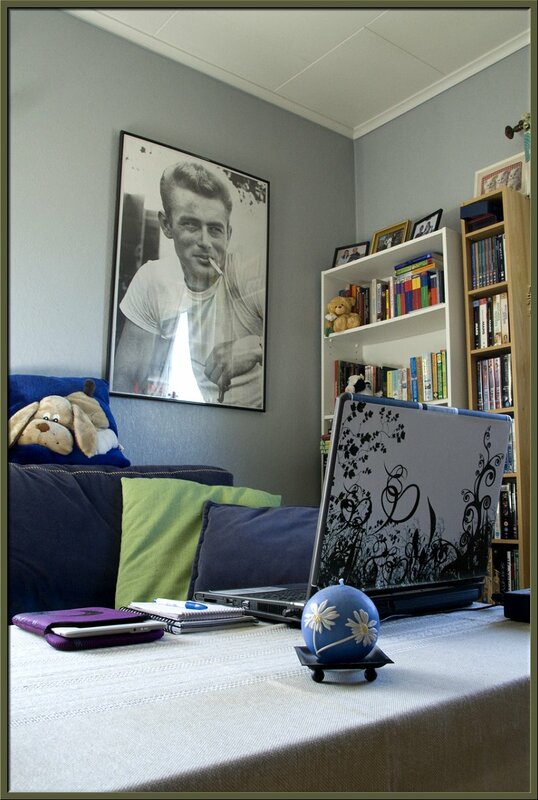 I was caught by the James Dean poster; I remember his charisma so well. Sometimes a small space is just right. The couch looks so comfortable and I like the light as well. Thanks for sharing. Oh, and the sunset is beyond words. I love this space and figure Hilde must be fascinating - there can't be too many 14 year olds out there saving up for a sofa! What a pleasant blue-green space! Cathy - Thank you for your kind words! That's actually the top of a lighthouse you see in the sunset picture (if the sun set that night, I can't remember if we still had the midnight sun when I took it). Barbara - That poster came home with me after a trip to San Francisco. I had the hardest time trying to fit it in my suitcase without ruining it! Thanks for the peek into your space. Buying the couch made me smile... that's something I would want now but the floor was just fine when I was a teen! Hilde-- That makes it even more special... I love lighthouses! if I had that view I would never get anything done!